It’s such a clichè, but it’s also totally true: how fast kids grow! And that of course means that they grow out of their clothes so quickly. But what a shame to get rid of clothes that still fit them in the waist. And that’s why every spring I go through their wardrobe and turn all their too-short pants or pants with holes in the knees (anyone with an active little boy knows what I mean) and turn them into shorts or skirts. 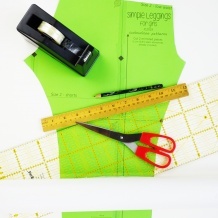 Turning pants into shorts is pretty straightforward: cut off the bottom of the leg and hem it. The only real difference in turning pants into a skirt is that you have to open up the leg seams and then close them back up again. 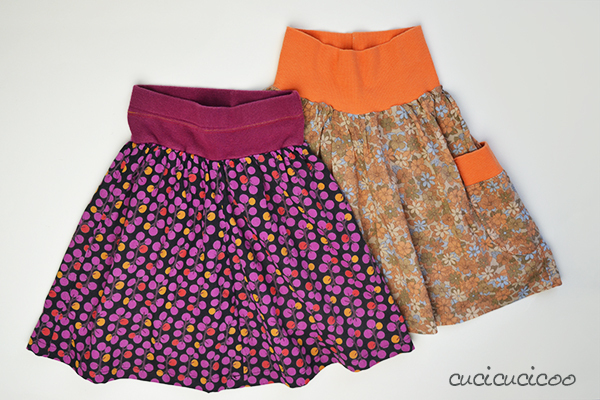 It’s so satisfying to make these adorable little skirts, which are perfect for summer playing and twirling. 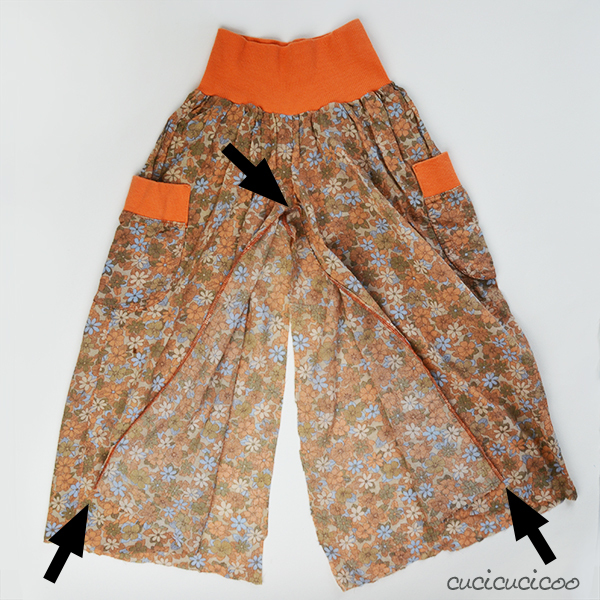 And it only takes about 15 minutes because the waistband is already made! Yah! Do your kids- or you- have any pants that are slowly making their way up their legs as they grow? Well, then, grab your scissors and we’ll fix them up right here and now! 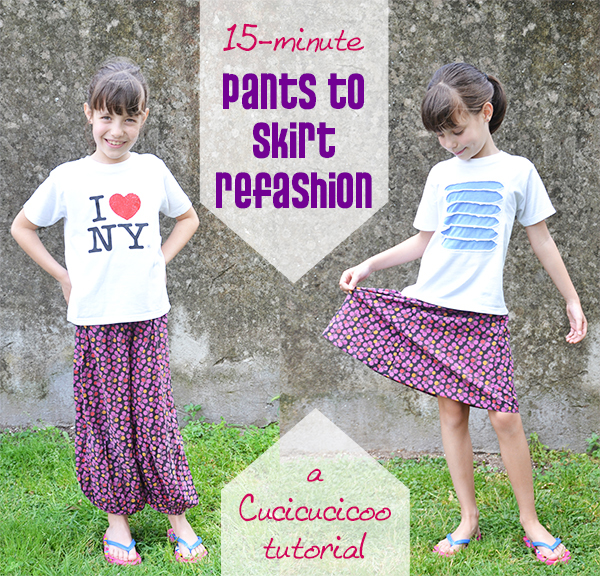 Now I’ll show you how to turn pants into a skirt! 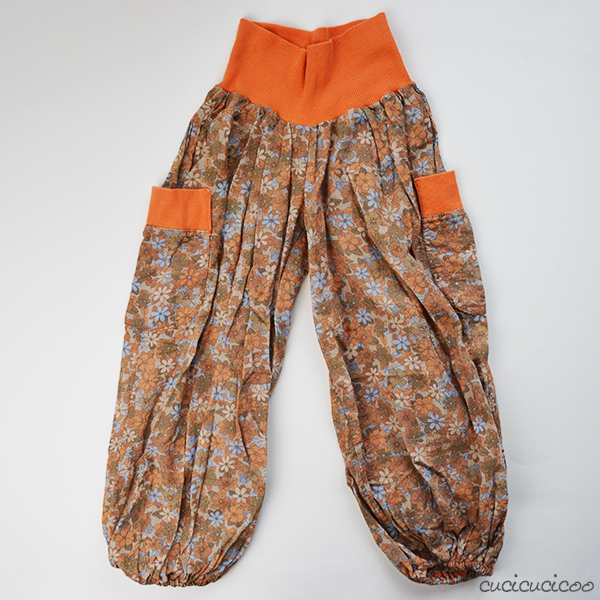 Here are a pair of my daughter’s pants, which actually started out as overalls that I refashioned into pants. She wore them frequently until they started getting really too short. Before we start, I’d like to clarify that this tutorial works fantastically for any lightweight fabric. I do not suggest this method for thicker fabric, such as jeans, because the seam will not lay flat properly. At some point I will share a tutorial for sewing a jean skirt from jeans, which is a different method. 1. Cut open the inner leg seam, as indicated by the arrows. If your pants have an elastic at the bottom, like these ones did, cut it off first. Iron the fabric so that it is nice and flat. Here’s a close-up of the crotch area. You can see that I cut right across from one leg to the other. 2. Turn the pants inside out and open the fabric up. Line up the cut edges from step #1 so that the two leg pieces are laying right sides facing, and pin them together (black circles on the left above). Use a fabric marking tool, such as tailor’s chalk, to draw a line from the existing seam to the cut edges (red oval on the left above). Make sure that the transition is smooth. Then sew from the existing seam all the way down the leg, sewing along the line that you’ve drawn (red oval on the right above). Then sew again along the raw fabric edges with a zig-zag stitch or an overlocker to keep them from fraying. It’s very important for the new seam to transition smoothly from the old seam. In the picture above, #1 is the garment’s original seam, #2 is the beginning of my new seam, and #3 is the beginning of my overlocked seam (to avoid fraying). You can see that my new seam (#2) starts inside the original seam allowance and works its way out so that the old and new seams create a straight line. 3. Repeat step #2 with the other raw edges on the other side. Press the seams flat. 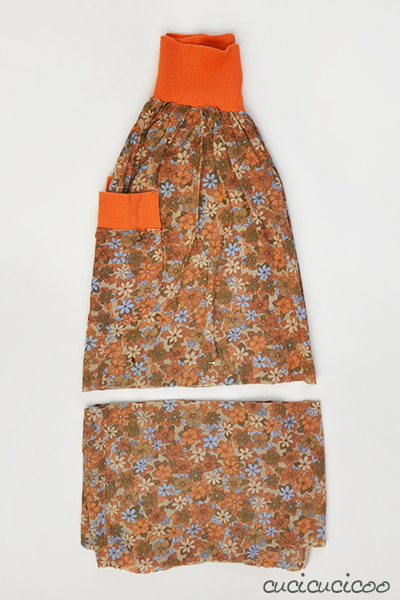 Turn the garment right side out, and you’ll see that it’s already a skirt! Of course the bottom looks very raggedy, so let’s fix that. 4. 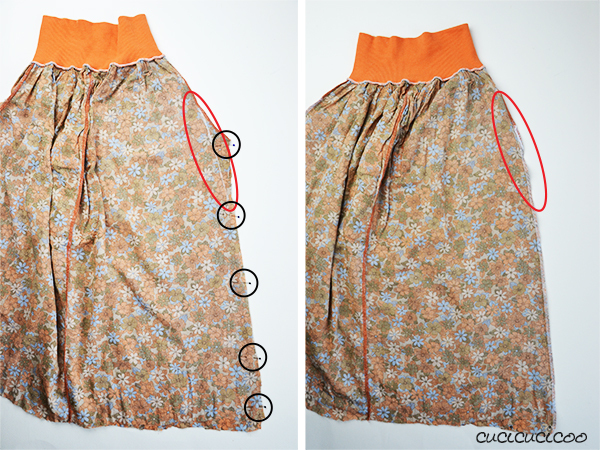 Try the skirt on your model and mark with a safety pin where you want the bottom of the skirt to fall. 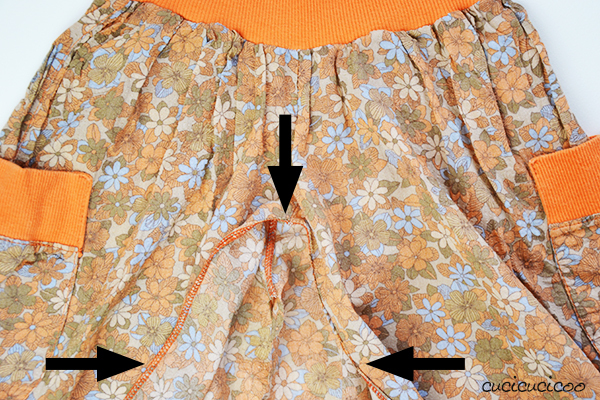 Fold the skirt in half, making sure to align the different layers of waistband and side edges and keeping the safety pin on the top layer, and cut across 3 cm below the safety pin. 5. 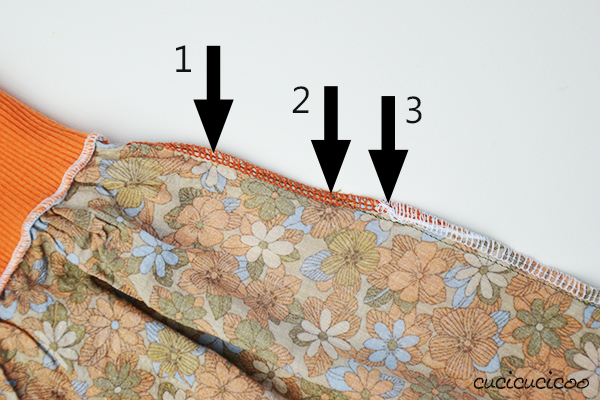 Turn the skirt inside out again and hem it by folding the bottom edge up 1 cm, ironing, folding up 2 cm, ironing and sewing in place with a seam allowance just under 2 cm. And that’s it! 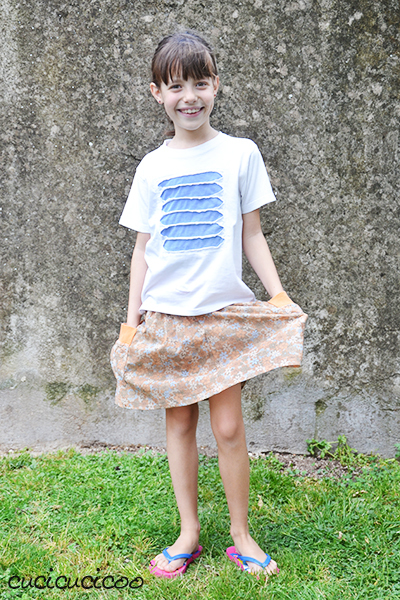 Let your model try on her new skirt on and love seeing how happy she is with it! Did you check the clock? I’ll bet it didn’t take you any longer than 15 minutes! So much satisfaction in so little time! 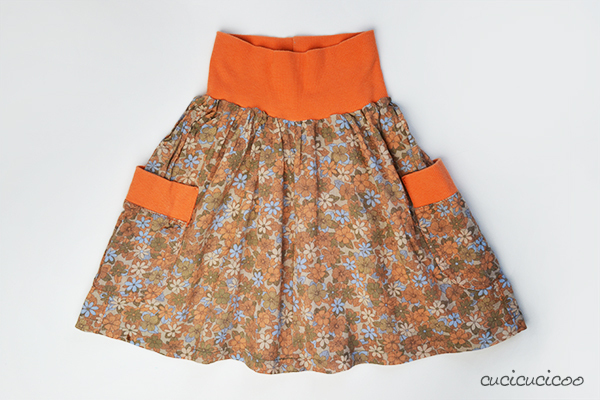 My daughter loves little skirts like this, so she was thrilled to have two new ones in half an hour! 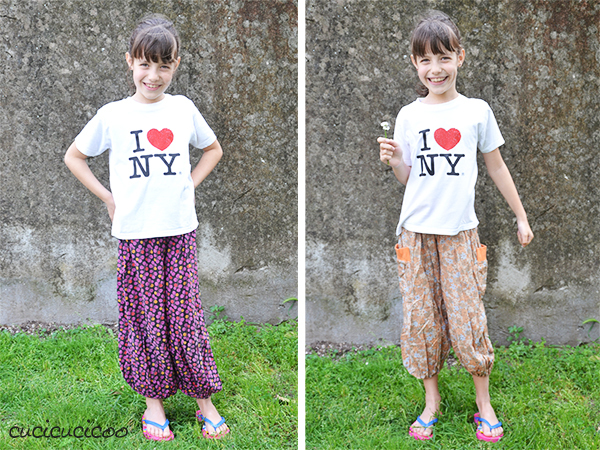 Now that you’ve seen how easy it is to turn pants into a skirt, you’ll be doing it with all your family’s pants, making them last twice as long! 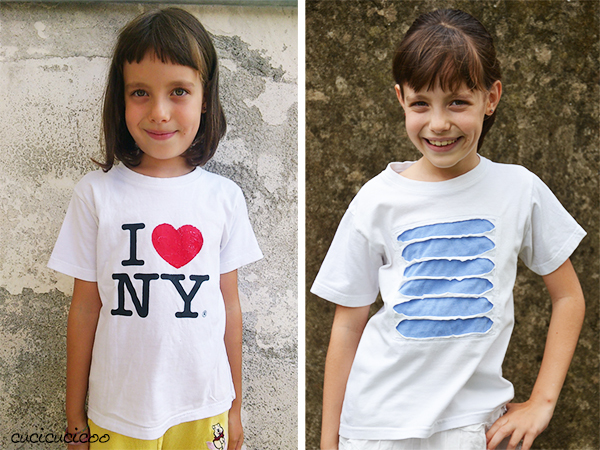 Did you notice the T-shirts my little girl is wearing in these pictures? It’s actually the same shirt! The heart had gotten ruined, so I cut out the I Love NY logo and replaced it with my slashed reverse appliqué embellishment technique. 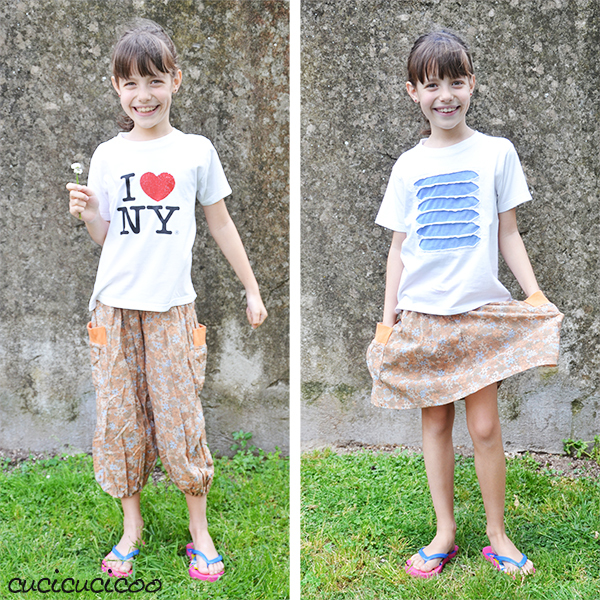 You can see more pictures of this transformation (as well as pictures of these skirts and some shorts that I made from pants) in this post from my Me-Made-May challenge last year. And if you want an idea of how to use the bottom strip of legs that you cut off in step 4, take a look at May 30 in that same Me Made May post! Eventually I will get around to posting a tutorial on that, too! 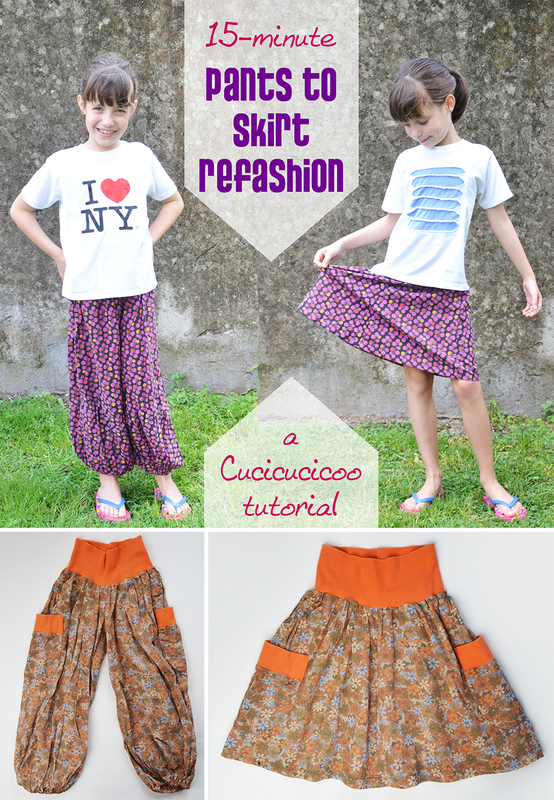 Do you love transforming clothes you don’t use anymore? 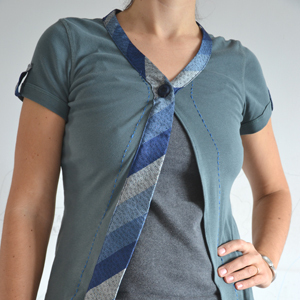 Check out my other quick and easy refashioning tutorials, such as this tie-shirt cardigan! 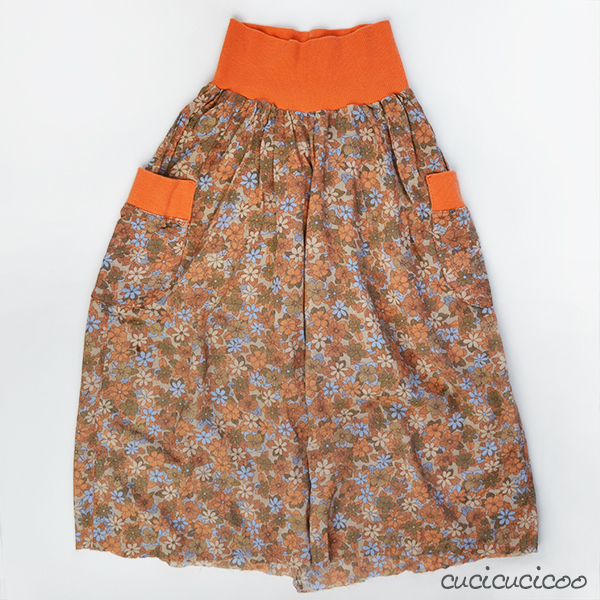 Love the refashioned skirts. No one will know they were once pants. Io sto cercando di fare il contrario. Ho una gonna di jeans leggero che voglio trasformare in pantaloncini :-). Vediamo se ci riuscirò! Ciao Lisa! Il link del tutorial che hai messo nel commento non funziona, rimanda ad una pagina che non esiste. Ho cercato nel tuo blog ma non trovo il post. Puoi controllare il link? Grazie! Ciao Lisa, sei sempre una campionessa! Io sono sempre qui a seguirti, anche se non commento sempre. Come stai? Grazie per il tuo lavoro che mi da tanta compagna! Ciao Lisa, spero che tu stia molto meglio e…. complimenti! sei davvero piena di idee fantastiche che realizzi con passione e .. si vede!! grazie x condividere tutto questo anche con me!